Every year my mother would give at least one BC, a Before Christmas present. Sometimes it was a pair of PJs to wear on Christmas Eve, or an extra present that needed to be given early in order to even out the gifts on Christmas morning. One year my BC was a shiny pair of Maryjanes that I wore to the midnight service like Cinderella with her glass slippers. This year all nonfiction writers got a BC. ALA Young Adult Library Services announced the creation of a new award for young adult nonfiction. What a wonderful and much-needed opportunity to highlight high quality exciting true stories that otherwise might linger unnoticed by the general public. If you are like me and are not on the list this year you might wonder why it is a BC for all. It is a gift because shining a light on these titles will also compel publishers to pay more attention to the design and production of nonfiction, and that will benefit all of us. And someday you may be on the list and that will make for a very happy New Year indeed! "Almost Astronauts: 13 Women Who Dared to Dream," by Tanya Lee Stone, published by Candlewick Press. "Claudette Colvin: Twice Toward Justice," by Phillip Hoose, published by Farrar Straus Giroux. "The Great and Only Barnum: The Tremendous and Stupendous Life of the Showman P.T. Barnum," by Candace Fleming, published by Random House. "Written in Bone: Buried Lives of Jamestown and Colonial Maryland," by Sally M. Walker, published by Carolrhoda Books. Finally, it is snowing like a proper Christmas season. It had been so hard to get into the holiday mood with the dog tracking in mud several times a day. Now Lily just shakes off a few flakes and hops on the couch where I sit still fishing for a good story. But it is more like ice fishing. It is cold and nothing is biting. This is a hard time to be without a distinct project. It is easy to get distracted by cookie baking and Christmas shopping. Perhaps it would be best to call it quits, enjoy the holiday and toss in my hook after the first of the year. It will give my brain a chance to mull over the half-formed ideas I already have. So if you see me out shoveling just remember that I'm still working. If I'm at the market -- still working. Walking the dog -- working. Napping -- working very hard. Back to the pond again. After handing in the revisions for my Roger Tory Peterson biography I am ready to go fishing for a new book idea. This is one of my favorite times when I can read in the middle of the day without feeling guilty that I'm not writing or washing the dishes. I drag out all of those scraps of paper holding hastily scribbled ideas and revisit previously past over subjects to see if they have fermented enough in the compost pile of my brain. I tend to find that ideas need to sit in the dark like wilted lettuce, orange rinds, coffee grounds and egg shells. Under the layers of everyday thought they mesh and meld. An occasional stir now and then and soon new workable ideas surface. I see a different approach to an old subject that I hadn't seen before, or several bits combine to form an entirely new project. Now is the time that I remember a librarian I met at the Rochester Children's book festival who rattled off several names of people kids learn about but there are no children's biographies about them. Do any have good stories to tell? I recall a radio show that mentioned Darwinian ideas long before Darwin, and watching on TV as an octopus uses a halved coconut like an undersea hovercraft. I throw out my hook and reel in a dozen books about forgotten aviation pioneers, women's rights activists, and nineteen century scientists. Will anything bite? I hope so. Something usually does, but they also might just end up in my mental compost pile until they are so ripe I can smell them. Then I have something new to write about. Hurray! I just received the flier for the W/C New York SCBWI conference that will be held January 9th. It features Clara McClafferty, a nonfiction writer!! I am so thrilled. Before I opened the brochure, I wasn't planning to go. I had already traveled to Columbus, Ohio in October for their SCBWI conference. But now I know that there will be someone there who will address the kind of writing that I do. I am so proud that nonfiction will be on the main stage. I will be there with bells on. Join me! A new month and a new attempt to write here more often. Today I met with my critique group in Rochester, NY. While most of us are reading our fiction works for critique it is clear that we are also doing lots of research for those projects and could definitely write a nonfiction piece using that research. Will we? Who knows, but the opportunity is there. 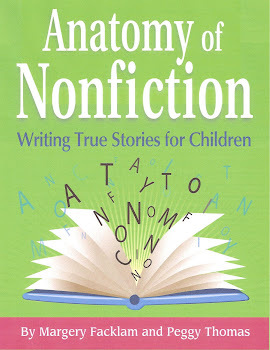 Even if you are not a nonfiction writer, do you have a nonfiction article or book inside of you? What research did you do for your latest fictional project? Kids love to know the story behind the story. Let them know more about the historical event that you used as a backdrop for your historical fiction. Write a how-to about that little known craft that you had to look up to make your story accurate. Or write about your writing process that led you to publish the story you are so proud of. There is a nonfiction story inside everyone. You just have to write it. This morning I am driving down to Jamestown, NY to meet Laura Jacques who will be illustrating my new picture book biography of Roger Tory Peterson. I am thrilled to get this opportunity, because it is rare that the author and illustrator meet. For those who don't know, typically, the editor will choose the illustrator for a text. The author has no say, which is okay with me because they know better than I do. Although I talked to Layne Johnson (illustrator of Farmer George Plants a Nation) on the phone and emailed a few times, I never met him. And all of my other nonfiction books were illustrated with photographs. So it is a real treat to meet Laura. She was chosen because she does exceptional work with birds, which a biography of RTP would require. I am excited to learn how she researches a topic visually. The more I think about it, the more I am convinced that her job is harder -she has to portray each bird accurately as well as the time period (1920s - 1990s), the character (RTP), and the places (Jamestown, NYC, etc.). I hope my words have inspired her enough to do just that. Last weekend I attended the COSCBWI conference in Columbus, Ohio. It was that group's first conference and they did a wonderful job setting up workshops with agent Erin Murphy, editors Ruta Rimas from Balzer and Bray and Kaylan Adair from Candlewick, as well as writers Cinda Chima, Shelley Pearsall and Tracie Vaughn Zimmer. However there was one part of children's literature that they neglected -- nonfiction. That was very apparent when in the Q & A someone asked about picture book biographies and the entire panel fell silent and just looked at each other. Although I learned a lot at the conference, the most pertinent information I gleened, not from the scheduled workshops, but from talking to other nonfiction writers during lunch. Kerrie Hollihan (author of Isaac Newton and Physics for Kids) and I exchanged editor information and talked about sales over a nice hot chicken buffet. And I met Nancy Roe Pimm (author of The Heart of the Beast) and John Becker (author of Wild Cats Past and Present) while they signed their books. I wish they had been giving a workshop too. Like wallflowers at a dance nonfiction writers tend to seek each other out at conferences and gab on the fringe of things trying to figure out how to take what the editors and agents say and adapt it to our projects. I know that the nonfiction workshops are sparsely attended compared to one about fantasy or picture books, but nonfiction is half of the market and should be addressed. Perhaps those of us who speak at writer's conferences need to come up with catchier workshop titles to bring in the audience. Or maybe when we go to conferences we just need to get over the feeling of being the ugly step sister at the ball, and get out there and dance! I am a nonfiction writer and I am proud of it.... And I am available to speak at writer's conferences! In SLJ's Extra, the Mock Newbery Blog discussed whether nonfiction was often left out of the discussion due to the Sibert award. Is a nonfiction title overlooked because the committee can say, 'leave it for the Sibert." I don't know if that is consciously the case but it may be subconsciously. After all ,how can a committee weed through such a huge variety of applicants. Just as picture books may be subconsciously set aside for the Caldecott, or YA the Printz, all of those nonfiction titles must be dealt with somehow. It makes me wonder why the Newbery is not catagorized in the first place. Every year we will have this discussion, because the Newbery is a contest that compares apples, oranges, kumquats, and watermelons. An impossible task that will never satisfy everyone. I, for one, never expect a nonfiction title to win the Newbery, and applaud the fact that the Sibert was created to give nonfiction the proper assessment, representation and honor that it deserves. 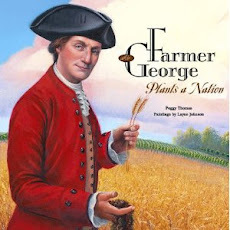 I know my title, Farmer George Plants a Nation was on both tables this past year and I never once gave a thought that it would be seriously considered for the Newbery because it was nonfiction. (But I did have high hopes for Layne Johnson's Caldecott-worthy art work - Sorry, Layne!). However I did feel confident enough in the quality of the writing, presentation, design and artwork, and the starred reviews it received, that it would be taken seriously by the Sibert. I'll never know at what point it got tossed off the table, but I am happy that there was a table for it to sit on. I believe that next year the Sibert winner should be sitting on the Today Show couch next to the winners of the Newbery and Caldecott. Let fiction have its Newbery. Let illustrators have their Caldecott. We have the Sibert! I'm just finishing up one project and haven't started another yet. I'm in that lull, floating in the gap between the waves waiting for the perfect one to ride in next. So which project should I choose? An article about the doctor I researched for my historical fiction? The picture book biography that I stalled on and put aside? Maybe now is the time to pull out one of my older manuscripts that didn't go anywhere. After moldering in the file cabinet, maybe now I can find the fatal flaws. It might be time to cast around for something new. Or maybe I should clean the office first. Box up the research notes, correspondence and first drafts of the books that came out last year. Maybe in my cleaning I'll discover a note from a long forgotten idea. I like this time. Bobbing in the calm water, I have time to look around, assess what I've done and where I want to go. But I don't want this calm to last too long. I need to keep writing. I need to keep researching, and lord knows there are enough true stories out there to choose from. I haven't yet read the book in question - Tanya Stone's Almost Astronauts -- but I am familiar with her other titles and believe that like most nonfiction writers she lets her passion for her subject shine through her text without bashing the reader over the head with her opinion. As nonfiction writers we do not share just a collection of dry facts but information flitered through our own perceptions. We are as biased as anyone else. But our bias is to present the facts through a hopeful lens. This world might not be perfect but with hope someday it will be better. I mentioned in an earlier blog, Nonfiction writer Milton Meltzer quote and I will mention it again -- He once said, "Almost everything I write has to do with social change -- how it comes about, the forces that advance it and the forces that resist it, the moral issues that beset m en and women seeking to realize their humanity... I have not been neutral; I see nothing wrong in the historian who feels a commitment to humane concerns -- to the ending of war, of poverty, of racism." Through our writing we show that there are struggles to overcome, whether it is learning how to play baseball or becoming the first female astronaut, and by telling the true stories of others who have struggled, we provide hope and motivation. If this is what was meant by the reviewer's comment, then I too have been guilty of editorializing. Hi, I knew that when I started this blog I would be writing in to the wind. So far no one has read what I have written. Rather than feel disappointed or abandoned, I feel liberated, free to write whatever I please. So I will confess -- I am writing a historical fiction novel and love it. Although I wanted to promote writing and reading nonfiction for children with this blog, I have felt like a hypocrite living in the fiction world for the last year. But let me redeem myself. I have done just as much research for this story as I have for my nonfiction titles. The story takes place in Poland during WWII and is based on a true story , so I have been reading dozens of fascinating first person accounts of Jews and Gentiles who survived Nazi occupation, learning about the underground newspapers, what people ate, how they stayed warm, how they would address each other, what merchandise was sold on the black market and even how a Polish boy would repair a flat bicycle tire. And of course, I have been stashing away several ideas for nonfiction articles to write when I am done.